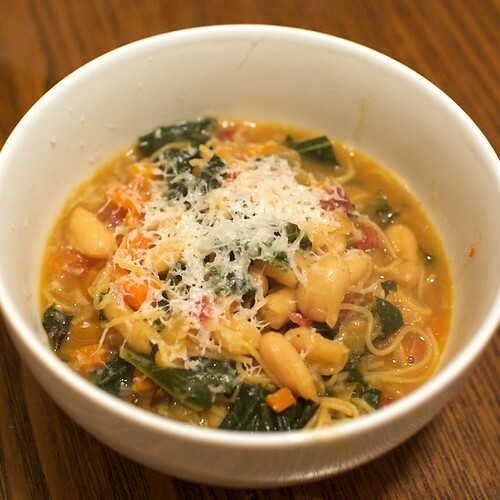 Ribollita is a rustic Tuscan soup which basically means re-boiled. 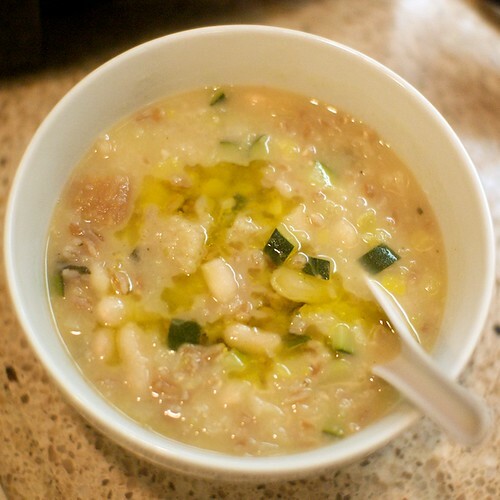 It’s typically made of cannellini, bread, and any type of vegetables that were around. Since I had some cannellini beans in the fridge from a previous meal, I used those, some stale bread which was diced roughly, leek, and zucchini. 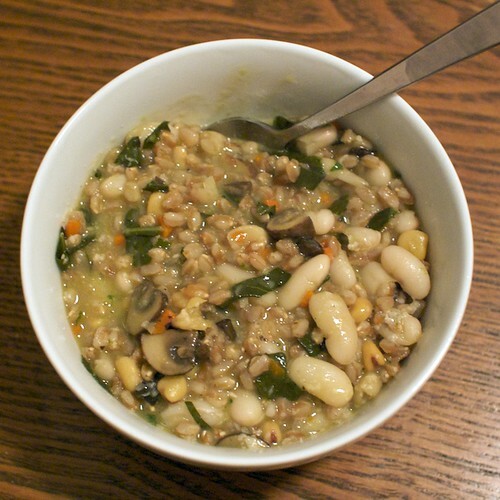 I wanted the soup to be more hearty, so I also soaked some farro beforehand to cook in the soup. This was a simple, easy to make, one-pot dish. I’d just like to say that leek is fast becoming one of my favorite aromatics. It’s like an onion (also good!) but more delicate and not as pungent, so it doesn’t leave you with an oniony mouth afterward. Will stayed home sick today from work, so I cooked him a hearty winter soup packed full of vitamins when I got home. It was pretty easy to make since I already had some ingredients sitting around at home. In a soup pot, pour in enough olive oil to cover the bottom and put it on medium-low heat. Dice the onion and put in the oil. Put in a pinch of salt and pepper and stir. Do the same for the carrots which go in right after the onions. Stir and let them soften. In the meantime, wash the greens and separate the stems of the chard. Dice the chard stems into the same size as the carrots and onions and put them in and give them a stir. While the onions, carrots, and stems are cooking down, wash and shake dry the rest of the greens. I separated the collards from their stems and discarded the stems. Roughly chop the leaves. They can be left pretty large since they shrink while cooking. When the onions and stems are tender, throw in the rest of the leaves and give it a stir. Then put in the cayenne pepper, aleppo pepper (if you have it) and stir to combine. Once the leaves are wilted and tender, open the can of beans and pour that in, soaking liquid and all. I guess you can rinse the beans, but I think the liquid gives the soup a nice thickness. Pour in the broth and water and stir to combine. Put the pasta in, cover the pot, leaving the lid ajar so it doesn’t boil over, and cook for 10 minutes, or until the pasta is done. Squeeze in the juice of half a lemon, add more salt and pepper to taste, ladle into bowls and then serve with some crusty bread. I had some cheese in the fridge, so I grated that over the soup. I initially was going to put a teaspoon or so of tomato paste to brown with the onions to give the soup more flavor, but in retrospect that’s not needed at all. The chard stems and all the other vegetables already have plenty of flavor.